With flexible banking options, state-of-the-art security and a perfect selection of games, Euromoon is an ideal destination for online gambling fans worldwide. Wandering around the casino’s website, one will not shake off the impression of having a moonlit walk along the Seine in Paris, near the Eiffel Tower and a Ferris wheel. 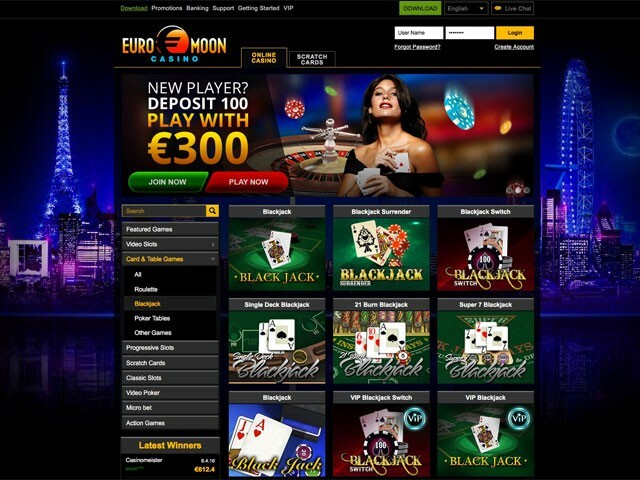 Euromoon is a great casino in terms of bonuses for new and regular players, cooperation with the globally acclaimed software vendors and a visually appealing website design. The casino boasts an incredibly big range of deposit options that are shown based on a player’s location detected by the casino automatically. Anyway, a player can change his location by choosing from over 100 countries in a drop-down menu. The minimum amount for cashing out is $100, and the maximum withdrawal limit is capped at a total of $5000 per month. If having an issue with some of the casino-related aspects, a player can get in touch with the customer support team via a 24/7 Live Chat, by email or by phone. The casino features the Help Center, that is an online knowledge base with extended descriptions and guidelines for some of the games (slots, roulette, video poker, etc.) offered by Euromoon. Fresh users that have just registered and placed the first deposit may claim for the 200% Welcome bonus up to $1000 (33 WR, B+D). For funding an account via selected payment systems, a player is entitled to claim the Payment Method Deposit Bonus up to $1000 (25 WR, B+D). All varieties of roulette count as 10% for wagering requirements and comp points.